In this section, we give a brief overview of the Content Grabber window. The Address Bar is where you enter the URL of the page that is the start of your web-scraping agent. This is what we call the Start URL. The Content Grabber web browser appears in the main panel. The special feature of this integral web browser is this: as you move the mouse and pass over a web element, you’ll see a yellow rectangle envelop that element. When you stop over one element and click on it twice, the Command pop-up window will appear—prompting you to choose the command that you want to insert into the agent for this data element. As you select data elements in the browser panel, the corresponding Command item will appear in the Agent Explorer panel. 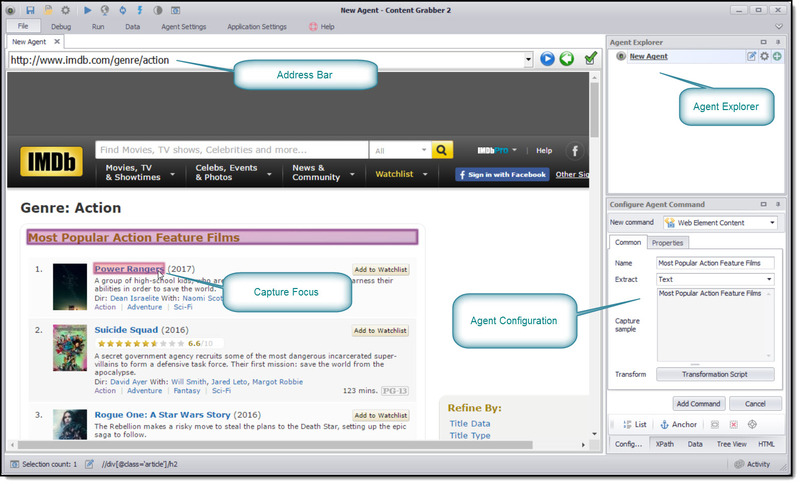 The Agent Explorer is used to view agent commands for the type of web page loaded in the selected browser tab. When you select a new browser tab with another web page, a new set of commands will be displayed in the Agent Explorer. You can use the Agent Explorer to view, edit or execute commands. In this panel, you can edit an agent command, execute a command, or add a sub-command. Further along in this guide, we’ll explain how to explore and edit each command.